Installation of the rail assembly and fixed shielding of the target system at China Spallation Neutron Source (CSNS) was accomplished on September 17. The rail assembly, 17 meters in length and 13 tons in weight, is the base of the integrated target system and acts as the key component to attain repeatable position precision for the target plug. The rail assembly and fixed shielding (16 tons) had to be installed into the enclosed trolley cask without a crane. A serial of customized hoist and moving tools were developed to accomplish this challenging installation task. 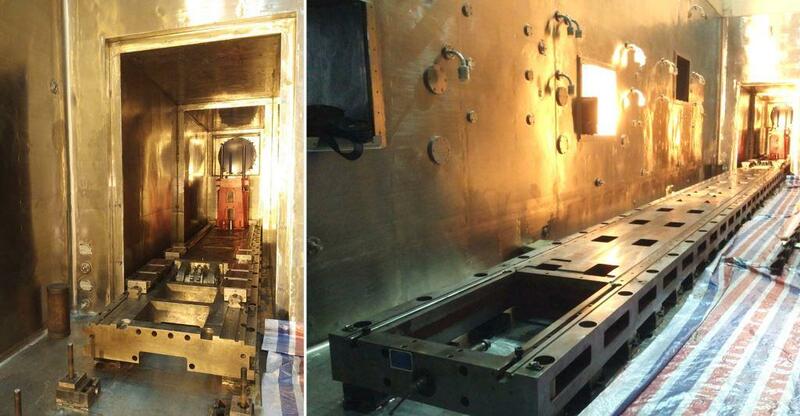 An experienced installation group was formed by Shanghai Baoye Engineering Technology Co., and the 70 wedge spacers supporting the rail assembly were positioned precisely and welded using an optimized process by China Nuclear Industry 23 Construction Co., Ltd. The precision was measured by the CSNS Alignment Group with a laser tracker after installation, showing that height difference and parallelism with proton beam meet the design requirements. The next installation phase of the target system has begun and the rest of the components will be transported to the CSNS campus as scheduled.